I love (like LOVE) reading "Day in My Life" posts, or watching them on YouTube, so I wanted to document this weirdo, crazy schedule I have as a full-time graduate student and part-time editorial assistant. I know I'm only going to have this schedule for a short time in my life, so even though it's kind of nutty I want to remember it. 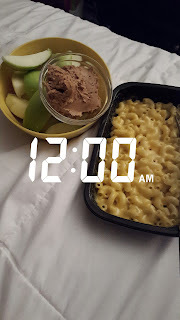 Excuse the time stamped snapchat photos but I figured it would be a good way of getting a glimpse of what I'm doing at certain points in the day. This specific day is a day when I go to work and go to school. On the two days I'm off during the week they mostly consist of sleeping in, working on homework all day, doing laundry, clean up, and meal prep which is kind of boring compared to my other days, which feel like a whirlwind. 6:40 am: Wake up, get ready, last minute organization like packing my bag or snacks for the day if I didn't do it the night before. 7:15 am: Leave the house. 8:00 am: When I try to get to work. I spend my mornings getting caught up on emails, checking spreadsheets, working on various projects, reading acquisitions, or going to AM meetings. Our department is waiting to expand into a new space our company is taking over, so in the meantime I don't have a conventional desk. I'm so excited to decorate my own space once we move over there in February! 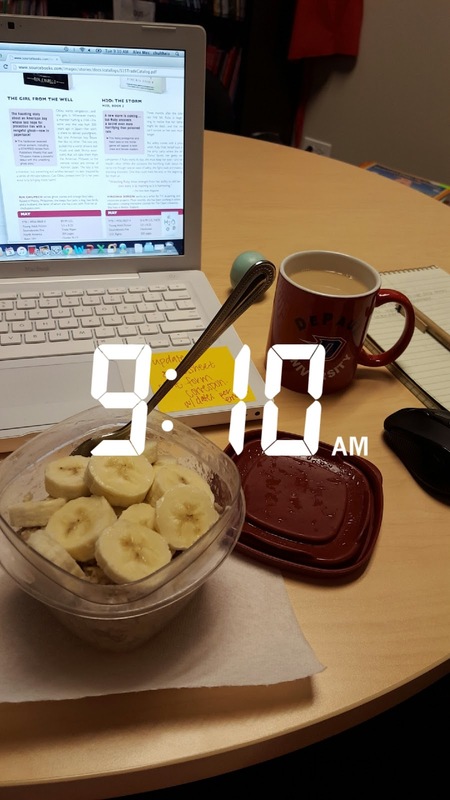 This was a day when I brought breakfast to work which was organic oatmeal and a cut up banana. I almost always have coffee or tea throughout the morning at my desk. I try not to snack on the other goodies people always bring into work but it never works. I really love snacks. 12:30 pm: I usually have lunch around this time with two coworkers I really like a lot. I'm so glad they invited me to eat with them on my first day as an official employee here (when I was an intern I sat at a different part of the office so I typically ate at my desk alone). We try to sit outside when it's nice out but lately we've been in the cafeteria since it's gettin' chillier outside! 1:15 pm: Back at my desk. I'm typically working on larger projects for the rest of the day. 3:30 pm: I pack up my bag, leave work, and walk over to to the train station right behind our office. 3:51 pm: I get on the Metra train. 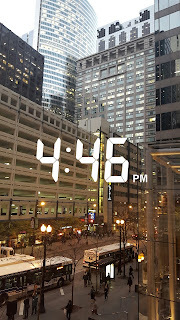 4:25 pm: I usually get downtown around this time and then I'll walk to my next train. If I need to run an errand, or grab a coffee, I'll do that before I get on the "L". This is my view from the platform waiting for the "L". I just love this city. 5:00 pm: Get on campus (usually a little after 5). How I spend my time before my class depends on the day. Sometimes I'll meet my girlfriend on campus and catch up and have dinner with her, but other times I'll sit outside my classroom and eat a dinner I've packed and spend time on my computer or prepping for class discussion. 6:00 pm: Class starts. This quarter I took ENG 407: Language and Style, ENG 432: Restoration and 18th Century Drama, and ENG 490: Magazine Writing. 9:00 pm: I get out of class around 9 and hang around campus doing homework until I can leave for my train. 9:40 pm: Leave for the "L". 10:05 pm: Get downtown and walk to Metra train. 10:15: Get on Metra train for the 10:30 departure. 11:45: Finally get home! Even though it's late, and I have to get up the next morning before 7am, I try to spend a little time winding down at home and then take a shower, lay out outfit for next day, pack lunch (if I feel like it otherwise I buy at work), and then finally get to sleep! Sometimes when I get to campus in the evening I don't have time or feel like eating dinner so when I get home, even at midnight, I'l eat something. 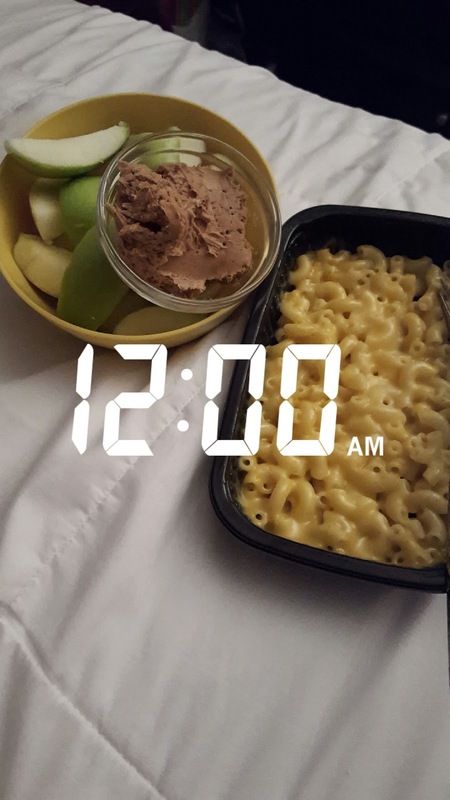 This night I had apples and peanut butter and a Trader Joe's reduced guilt mac & cheese frozen dinner. It's a terrible time to eat but if I'm hungry I'm not the kind of person that's not going to eat just 'cause of the time haha. This is a perfect example of why I can't wait for break because I'll be able to get back into better eating habits. And if after seeing that picture of my mac & cheese dinner anyone thought of the movie scene below WE ARE NOW BEST FRIENDS. Now that I'm on break (starting today!!) 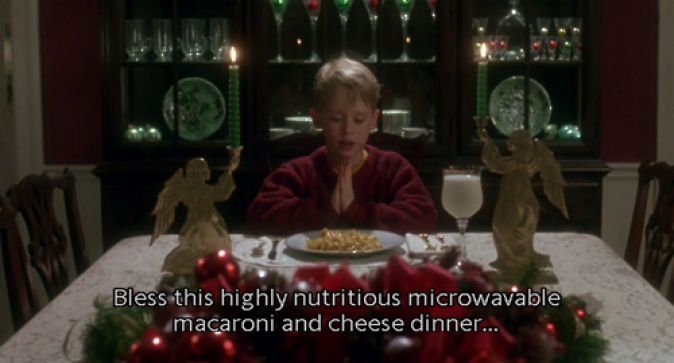 my schedule will consist of work, binge watching so.many.tv shows, obsessing over the holidays (like crazy woman obsessing like let's make shopping lists and get our Christmas tree tomorrow and leave it up till March and lets make stuffing everyday for lunch and lets have Home Alone on constant loop on the tv and only Christmas music from now on and everything peppermint amen), and getting to spend much more time with my family and friends. I love, love, love day in the life posts! And snacks, but you already knew that! 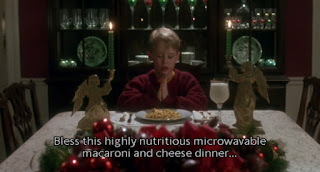 That is my second favourite Home Alone scene, the first is "Fuller! Easy on the Pepsi!" because it reminds me of basically every family gathering when all my cousins were small! Ah, me too! & yasss snacks, girl. Also, I'm SO happy you like Home Alone too! !